A couple months ago, I had a Cardamom-Rose truffle at Eclipse Chocolat, a local chocolate shop. I was in love! I had never had chocolate cardamom and rose together but somehow it felt very familiar, very Indian. The candied rose petals on the truffle were so yummy. A crunchy sugar-y taste of rose that’s not too overpowering. I asked about the candied rose petals and was told that they were imported from France and that they were available for sale at the shop. I took one look at the price tag and resolved to figure out how to make them. 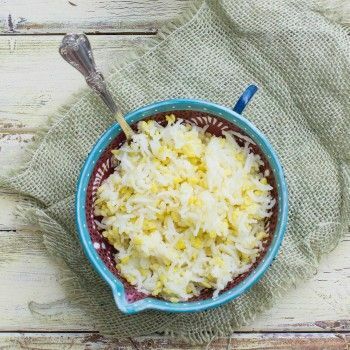 I found this recipe for Persian Love Cake on Epicurious that also has a method for making candied rose petals. Yes! This was a great starting point for my candied rose petal experiments. In my last post about rose petals, I mentioned I had a hard time finding edible rose petals. Since then, my parents have promised me roses from their yard that they grow without pesticides, but every time I see them I forget to ask for them. And of course, as always, I start experimenting in the middle of the night without any planning and had to use what I had on hand. So I used the same dried rose buds as before. I started by painstakingly trying to separate the dried rose petals from the tiny buds. I dipped each tiny little petal in the egg white and then in the sugar. After about 10 of those, I gave up! Especially because the petals got smaller as I peeled more layers of the bud. So I just crumbled the rest of the rose petals, tossed them all into the egg white and mixed in the sugar with it all to. I tossed it all into a sandwich bag and piped little dots with the mixture. I was holding my breath as they dried. Hoping they’d work out. And surprisingly enough, they turned out okay! Yes, they’re not the most beautiful candied rose petals in the world. But they work! 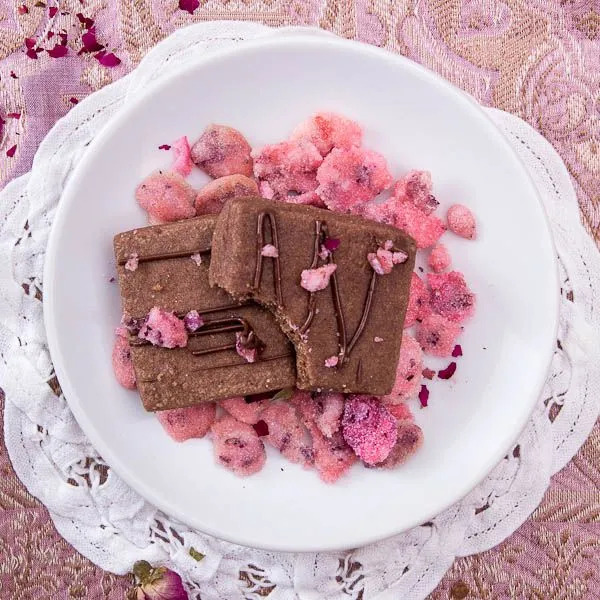 I crushed up my candied rose petal dots to use as a topping for these chocolate cardamom shortbread cookies that are inspired by the delicious cardamom-rose truffles of Eclipse Chocolat. Toss the flour, sugar, cocoa powder, cardamom, and salt into a food processor. Pulse to combine. Add in the butter and vanilla. 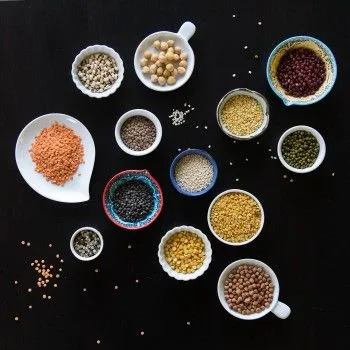 Pulse until the mixture clumps together to form a dough. 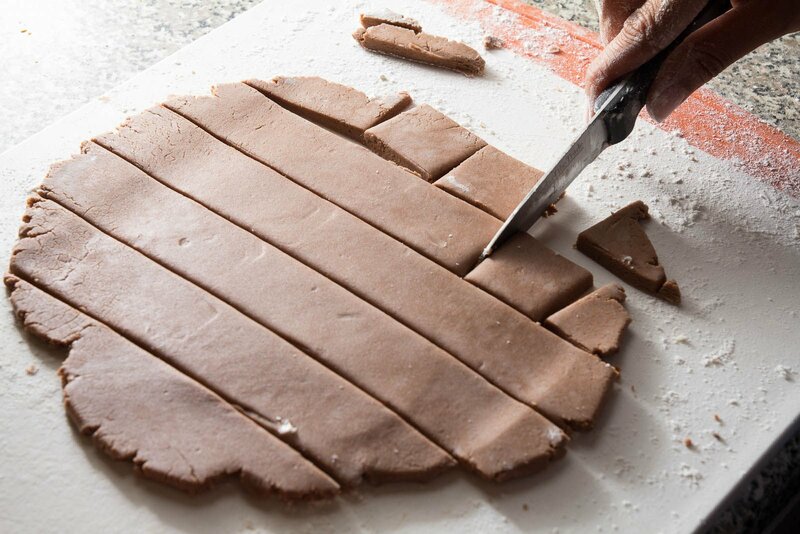 On a lightly floured surface, roll out the dough till it’s 1/4 inch thick. Using a pairing knife, cut into 1 inch squares. 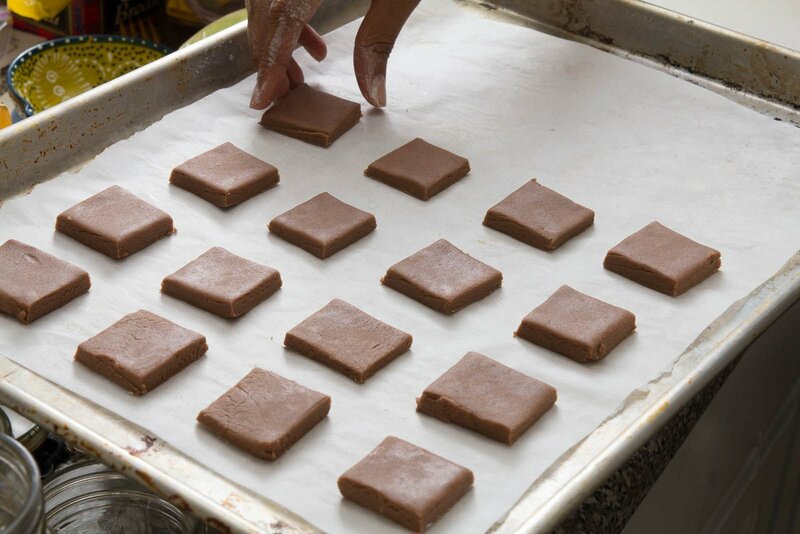 Lay out the squares about 1/2 inch apart on a baking sheet lined with parchment (I needed two baking sheets). Bake until the cookies are firm to the touch. About 20 to 25 minutes. Make sure to rotate the sheets about half way. 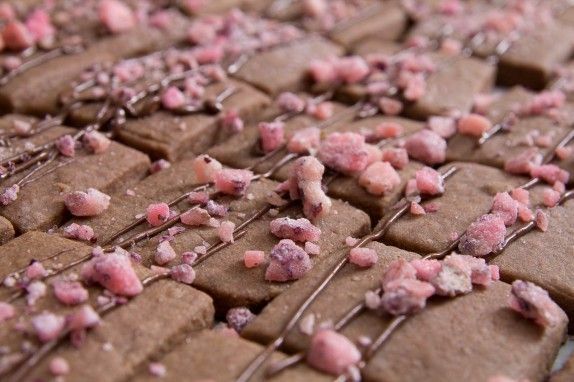 While the cookies cool, crush the candied rose petals into small pieces. When the cookies are completely cool, heat about a cup of water in a pan till it simmers. Do not let it boil. Place a bowl over the pan, making sure that it does not touch the water and add in the chocolate. Stir until it melts. 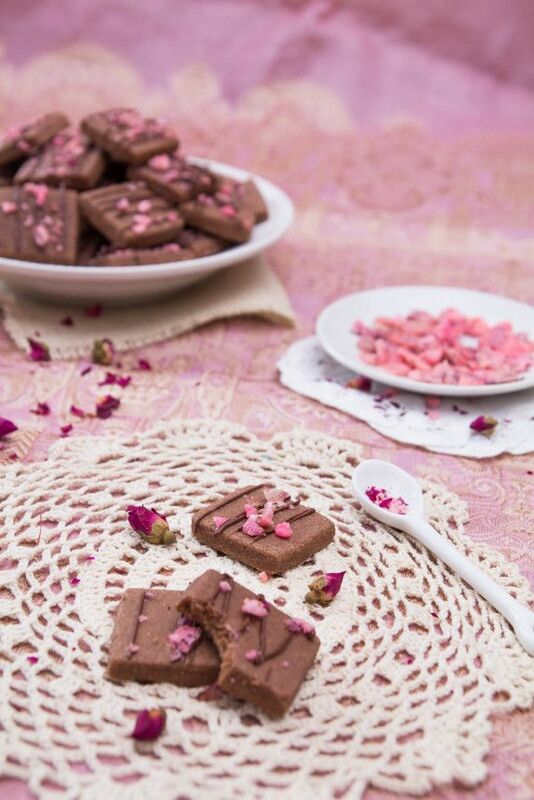 Drizzle the chocolate over the cooled cookies and quickly sprinkle the crushed rose petals over the cookies. The petals will stick to the melted chocolate and set in place as the chocolate sets. Remove the green parts of the rose bud and crush the petals with your fingers. 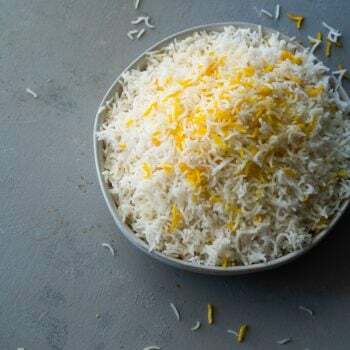 You will end up with differently sized flakes of petal. In a medium bowl, whisk the egg white until it foams up and looks like bubble bath. Toss the sugar into a zip top sandwich bag. Add the food coloring if you’re using it. It’ll give you the pretty pink color. Zip the top and shake around until the color is evenly pink. Add in the petals to the bag. Shake. Add in the egg white. Seal the bag and mash it about gently until the egg white and sugar are well combined. If the mixture looks really runny, add in more sugar a tablespoon at a time. Snip one corner of the bag and pipe dots onto a baking sheet lined with parchment. Let the candied rose petal dots sit in a cool dry place overnight to dry. Makes about 2 dozen shortbread cookies. Next time I make this I think I will try using about half the cocoa powder to emphasize the cardamom flavor. Recipe for the Candied Rose Petal Dots is adapted from Bon Appetit. Disclosure: We are a member of the Amazon affiliate program. If you click on the above link and make a purchase, we will get a small percentage of the proceeds. 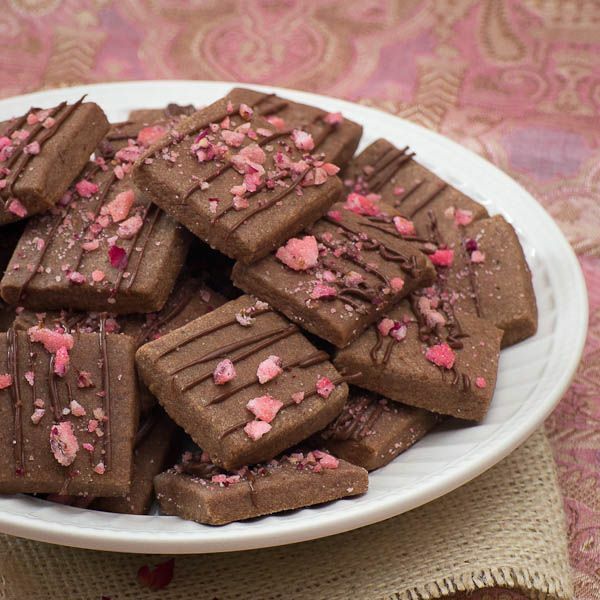 Comments on "Chocolate Cardamom Shortbread Cookies with Candied Rose Petals"
How beautiful is that! 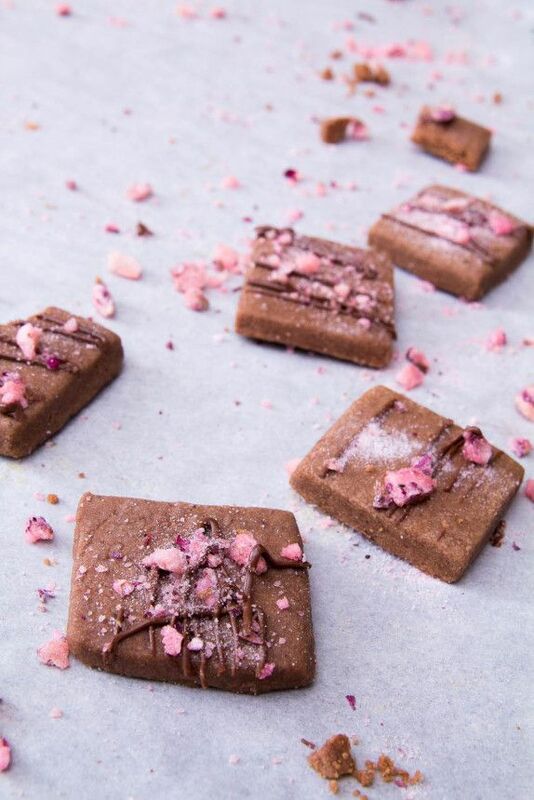 I love your idea to combine rose and cardamom.